Nakamura Kanjaku, who will take the prestigious name of Nakamura Ganjirô IV in January 2015 and February 2015 in Ôsaka at the Shôchikuza, went to the Kôzu Shrine to pray for the success of his 2015 shûmei performances. The prayers were followed by a funa norikomi, a kôjô and the traditional hand-clapping ceremony (koshiki tejimeshiki in Japanese) in front of the Shôchikuza [more details (in Japanese) and pictures]. The February 2015 Grand Kabuki programs at the Kabukiza have been published! The highlight will be the spectacular and beautiful dance-drama "Seki no To"! The dance-drama "Kanda Matsuri" will also be a rare treat as it was staged for the last time in October 1997. "Soga no Ishidan" is famous for its tachimawari on giant stone steps followed by a spectacular gandô-gaeshi. The others items -"Keya-mura", "Jinmon/Kumiuchi" and "Fudeya Kôbê"- will be classics whose leading actors will respectively be the Heisei stage giants Onoe Kikugorô, Nakamura Kichiemon and Matsumoto Kôshirô [more details]. The March 2015 Grand Kabuki programs at the Kabukiza have been published! The classic "Sugawara Denju Tenarai Kagami" will be staged as a tôshi kyôgen with a troupe led by the zagashira Kataoka Nizaemon, who will play the role of Kan Shôjô in "Hippô Denju" and "Dômyôji". The roles of the brothers Matsuômaru, Umeômaru and Sakuramaru will be played by Ichikawa Somegorô, Kataoka Ainosuke and Onoe Kikunosuke. Their wifes Chiyo, Haru and Yae will be played by Kataoka Takatarô, Bandô Shingo and Nakamura Baishi. The roles of Shiratayû, Tatsuta-no-Mae, Shihei and Haji no Hyôe will be played by Ichikawa Sadanji, Nakamura Shibajaku, Bandô Yajûrô and Nakamura Karoku. The role of Takebe Genzô in "Hippô Denju" and "Terakoya" will be played by two different actors, Ichikawa Somegorô in the former act and Onoe Shôroku in the latter act. The role of Genzô's wife Tonami in "Hippô Denju" and "Terakoya" will also be played by two different actors, Nakamura Baishi in the former act and Nakamura Kazutarô in the latter act. The last but not the least, the difficult role of Kakuju will be performed for the first time by stage veteran Kataoka Hidetarô [more details]. Ichikawa Ennosuke and the Omodakaya guild will perform in April 2015 in Nagoya at the Chûnichi Theatre. The main guest star of Ichikawa Ennosuke will be Kataoka Ainosuke [more details]. The Heisei Nakamuraza will be back next year in Tôkyô in Asakusa in April 2015 and May 2015. There was no Heisei Nakamuraza in Tôkyô for 3 years, following the sudden death of its creator Nakamura Kanzaburô XVIII. The troupe will be led by Nakamura Kankurô and his main stage partners will be Nakamura Shichinosuke, Nakamura Hashinosuke, Bandô Yajûrô and Nakamura Shidô. The staged dramas or dance-dramas will be "Sumôba", "Kanjinchô", "Sakanaya Sôgorô", "Mikasayama Goten", "Takatsuki" and "Yudono no Chôbê". Naoya, son of Nakamura Kankurô and grandson of late Nakamura Kanzaburô, will make his first appearance on stage! The actor Ichikawa Michiyuki will take the name of Ichikawa Kudanji IV (a name not holden for 60 years!) in January 2015 at the Shinbashi Enbujô [more details]. The 6th edition of the Sistine Kabuki, a Kabuki program led by Kataoka Ainosuke within the Sistine Hall of the Ôtsuka Museum of Art which is located in the city of Naruto (Tokushima prefecture), will happen in February 2015. A newly-created play, which is based on the legend of Ulysses, will be staged ... with the actress Yamato Yûga in the casting [more details]. A hot topic for 2015: Oda Eiichirô's internationally popular manga "ONE PIECE" will get Kabuki adaptation by Ichikawa Ennosuke in Fall 2015. Technically and artistically speaking, it won't be Kabuki but Sûpâ Kabuki Sekando (the second generation of Sûpâ Kabuki), a genre created by Ichikawa Ennosuke III and continued by his nephew Ichikawa Ennosuke IV. This future "ONE PIECE" à la sauce Kabuki will be staged in Tôkyô at the Shinbashi Enbujô in October 2015 and November 2015. As part as the Shinema Kabuki ("Cinema Kabuki") series, the drama "Sannin Kichisa", which was shot live in high definition in June 2014 at the Cocoon Kabuki (Tôkyô), will be released all over Japan from the 27th of June 2015. This will be the 22nd "Cinema Kabuki"! Opening of the official website for the 1st edition of the Roppongi Kabuki [more details about the performances]. The ceremony of the delivery of the nadai certificate to all the actors who passed this exam in 2014 happened the 26th of November 2014 in the VIP room of the Kabukiza. The certificates were given by Living National Treasure Sakata Tôjûrô and Nakamura Baigyoku. Here is the list of the 22 actors who received their certificate: Bandô Takeaki, Bandô Tamao, Ichikawa Kien, Ichikawa Shôichi, Kataoka Takashi, Nakamura Chôhachirô, Nakamura Harunosuke, Nakamura Hayato, Nakamura Ichô, Nakamura Kashô, Nakamura Kyôzaburô, Nakamura Sen'ichirô, Nakamura Tanenosuke, Nakamura Toshijirô, Nakamura Yonekichi, Onoe Matsugorô, Onoe Midori, Onoe Otonosuke, Onoe Ukon, Ôtani Hiromatsu, Ôtani Hirotarô and Kamimura Jun'ya. The 15th Training Recital at the National Theatre produced by the Organization for the Preservation of Kabuki will happen the 24th of January 2015. It will start at 5:30 PM and tickets will all be priced 2000 JPY. A cheap way to see real Kabuki done by stars' disciples on the main stage of the National Theatre [more details]. The 9th of November 2014, the young star Ichikawa Ennosuke IV did his 600th chûnori. It happened at the Meijiza in the drama "Shitennô Momiji no Edoguma". His first chûnori occurred in October 1985 at the Kabukiza in the drama "Futago Sumidagawa". He was still a child and did the chûnori along with his uncle Ichikawa Ennosuke III and Onoe Kikugorô VII. His next challenge might be to do more chûnori than his uncle but there is a long way to go as his uncle did it more than 5000 times. The Heisei Nakamuraza will be in Kanazawa at the Kagekiza from the 20th to the 23rd of March 2015. The kaidanmono "Kaidan Chibusa no Enoki" will be staged with most likely the same casting as in New York in July 2014 and at the Kabukiza in August 2014 [more details]. The dance master Fujima Kanshie, the wife of late Morita Kan'ya XIV and the adoptive mother of Living National Treasure Bandô Tamasaburô, died in Tôkyô the 23rd of November 2014. She was 89 years old and her real name was Morita Akashi. The Kabuki sakusha and stage director Nakawa Shôsuke died the 13th of October 2014 in Ôsaka. He was born in 1931 and his real name was Nakagawa Yoshizô. He worked with Ichikawa Ennosuke III on many revivals of long-forgotten dramas like "Haji Momiji Ase no Kaomise", "Hitori Tabi Gojûsan Tsugi" or "Ogasawara Shorei no Oku no Te" to name a few. Nakamura Matagorô has received the Purple Ribbon Medal (Shiju Hôshô in Japanese), one of the six Japanese medals of honor awarded by the Japanese Government to deserving citizens. Ichikawa Ebizô and Nakamura Shidô will be the stars of the 1st edition of Roppongi Kabuki from the 3rd to the 18th of February 2015 at the EX THEATER in Roppongi, a district famous for its (sometimes sleazy) night life. The script was written by Kudô Kankurô, who already did "Ôedo Ribingu Deddo" in 2009 [more details] and "Tennichibô" in 2012 [more details]. The stage direction will be done by the famous movie director Miike Takashi, an expert in violent and bizarre movies who worked twice with Ichikawa Ebizô in the movies Hara-Kiri: Death of a Samurai (2011) and "Over your Dead Body" (2014). The story will be about a space alien invasion of Earth. The alien invaders coming from outter space will land in Edo during the Genroku period. The head of the extraterrestrial forces will be Nakamura Shidô, the villain in this play. The savior of Planet Earth will be Ichikawa Ebizô, the warrior in shining armor. The title will be "Chikyû Nagegorô Uchû no Aragoto". Literally "Earth-throwing Gorô Space Aragoto" [more details]. We forgot to report that Bandô Shinsha was finally back in the Kabuki world. He left it at the beginning of 2014, most likely expelled from the Otowaya guild by his master Bandô Takesaburô. He was back on stage in September 2014 in Kyôto at the Minamiza ... as a disciple of Ichikawa Ebizô, who gave him the name of Ichikawa Michiyuki! Nakamura Kyôzô will perform the 27th of January 2015 in a special Buyô program, which will be staged at the Nihonbashi Kôkaidô in Tôkyô. He will perform in "Bungo Dôjôji" and "Ninin Wankyû". Mea culpa! : I've reported that Nakamura Fukusuke would be back on stage in November 2014 to perform in a non-Kabuki drama entitled "Memories of the Sun Goddess HIMIKO". I have to correct this piece of information by writing that he will be credited as stage director but he won't perform on stage. His son Nakamura Kotarô will perform but not Nakamura Fukusuke. Young popular star Ichikawa Ennosuke will perform for the very first time at the newly-built Kabukiza, next year in January 2015 [more details]! The programs for the 2 months of shûmei for Nakamura Ganjirô IV, in January 2015 and February 2015 in Ôsaka at the Shôchikuza, have been published. In January 2015, the guests of the new Ganjirô will be Living National Treasure Sakata Tôjûrô, Kataoka Nizaemon, Nakamura Baigyoku, Nakamura Hashinosuke, Kataoka Ainosuke, Nakamura Senjaku, Kataoka Gatô, Bandô Yajûrô, Kataoka Hidetarô and Bandô Takesaburô [more details]. In February 2015, his guests will be Living National Treasure Sakata Tôjûrô, Nakamura Senjaku, Ichikawa Ennosuke, Nakamura Baigyoku, Kataoka Gatô, Bandô Yajûrô, Bandô Takesaburô, Onoe Shôroku, Nakamura Kazutarô, Ichikawa Monnosuke and Nakamura Kikaku [more details]. Ichikawa Somegorô will perform for the very first time the prestigious role of Musashibô Benkei in the dance-drama "Kanjinchô" in November 2014 at the Kabukiza. This role is an atariyaku for his father Matsumoto Kôshirô. It was also the most significant role for Matsumoto Kôshirô VIII or Matsumoto Kôshirô VII. These 3 actors have performed it more than 3000 times! Ichikawa Somegorô has already performed many roles in "Kanjinchô" like Minamoto Yoshitsune, Togashi Saemon, Suruga Jirô, Kamei Rokurô, Kataoka Hachirô or the sword-holder Otowaka ... but never Benkei [a special poster of Ichikawa Somegorô in the role of Benkei]. The 32nd anniversary (33rd memorial service) of the passing away of Matsumoto Hakuô will be commemorated next month (November 2014) at the Kabukiza. Matsumoto Kôshirô and Ichikawa Somegorô went on the grave of their father and grandfather the 17th of October in Tôkyô. The tombstone of Matsumoto Hakuô is located in the precincts of the Honmonji Temple in Tôkyô. Ichikawa Somegorô will perform for the second time the prestigious ten roles of "Date no Jûyaku" in February 2015 in Fukuoka at the Hakataza [more details]. He performed them for the first time in May 2014 at the Meijiza [more details]. These roles were the privilege of the star Ichikawa Ennosuke, who revived them for the first time in April 1979 and performed them in 9 productions from 1979 to 1999. In the 2010s, it was staged 3 times with Ichikawa Ebizô in the 10 roles, in January 2010 and August 2012 at the Shinbashi Enbujô, and in May 2013 at the Minamiza. Living National Treasure Bandô Tamasaburô and young star Ichikawa Ebizô will be the stars of the two programs at the Kabukiza in December 2014. They will play the roles of the courtesan Matsuyama and Wankyû in "Ninin Wankyû" and the roles of Princess Kumo-no-Taema and the evil priest Narukami in "Narukami Fudô Kitayama Zakura" [more details]. Living National Treasure Bandô Tamasaburô will play two spectacular and physically-demanding roles in January 2015 at the Kabukiza: the leading roles of "Kumo no Hyôshimai" and "Onna Shibaraku" [more details]. Matsumoto Kôtarô, a disciple of Matsumoto Kôshirô, will take the name of Matsumoto Komagorô III in November 2014 at the Kabukiza, playing the role of Kajiwara Heiji Kagetaka in the drama "Kumagai Jin'ya". The Shôchiku Company will celebrate its 120th anniversary in 2015. A special logo and a reminder will be printed on every Shôchiku-sponsored program in 2015! The company was founded in Kyôto in 1902 but Ôtani Takejirô, one of the two founders, started the theater production business in reality in 1895. The two Kabuki programs of January 2015 at the Asakusa Kôkaidô have been published! The main actors will be Onoe Matsuya, Nakamura Kashô, Bandô Minosuke, Nakamura Kotarô, Nakamura Yonekichi, Nakamura Hayato and Nakamura Tanenosuke. It is worthy to note that the usual stars of the Asakusa Kôkaidô have passed the torch to a new generation of young actors [more details]. Ichikawa Tsukinosuke will perform in December 2014 at the Shinbashi Enbujô with a Kigeki troupe in a program which is entitled "Warau Kado niha Fuku Kitaru" (literally "good fortune and happiness will come to the home of those who smile"). The troupe is led by Fujiyama Naomi. Onoe Matsuya will perform in November 2014 at the Galaxy Theatre in the Japanese version of Stephen Dolginoff's musical "Thrill Me". He will be paired with the musical actor Kakizawa Hayato. The Living National Treasure Tokiwazu shamisen player Tokiwazu Eiju was put by the Japanese Ministry of Education, Culture, Sports, Science and Technology in the list of Japanese personalities who have made outstanding culture contributions in Japan in 2014 (bunka kôrôsha). The ceremony will happen the 4th of November 2014. As previously reported in this section of the site, Nakamura Kanjaku V will take the name of Nakamura Ganjirô IV in January 2015 and February 2015 in Ôsaka at the Shôchikuza. The roles in which he will perform have been published: in January 2015 the new Ganjirô will play the roles of Fujiya Izaemon and Kameya Chûbê in "Kuruwa Bunshô" and "Fûin Giri" [flyer in Japanese]. In February 2015 the new Ganjirô will play the roles of Matahei, Tokubê and the father shishi in "Domo Mata", "Sonezaki Shinjû" and "Renjishi" [flyer in Japanese]. The programs for the kaomise in Kyôto, in December 2014 at the Minamiza, have been published. The stars of this kaomise will be Living National Treasure Sakata Tôjûrô, Kataoka Nizaemon, Matsumoto Kôshirô, Nakamura Baigyoku, Nakamura Hashinosuke, Nakamura Senjaku, Nakamura Kaishun, Kataoka Gatô, Kataoka Takatarô, Nakamura Kankurô, Nakamura Shichinosuke and Kataoka Hidetarô [more details]. Nakamura Fukusuke will be back on stage in November 2014! Not in Kabuki performances. He will perform along with his son Nakamura Kotarô in a newly-created dance-drama which is entitled "Memories of the Sun Goddess HIMIKO". It will be staged in Tôkyô the 18th of November at the Suntory Hall, in Sapporo the 24th of November at the Concert Hall and in Fukuoka the 26th of November at the Symphony Hall [more details]. Nakamura Fukusuke stopped acting from the 14th of November 2013 due to illness (high blood pressure). His expected shûmei (he was supposed to take the name of Nakamura Utaemon VII in March 2014) was postponed and it took him one full year to recover. Living National Treasure Bandô Tamasaburô will perform at the Yachiyoza, a traditional wooden-built theater, from the 29th of October to the 2nd of November 2014 in 3 traditional Jiutamai dances [more details]. The 7th edition of the Eirakukan Grand Kabuki will happen from the 4th to the 9th of November 2014 at the Eirakukan, a renovated traditional theater built in the city of Toyooka (prefecture of Hyôgo). The zagashira will be as usual the young star Kataoka Ainosuke [more details]. 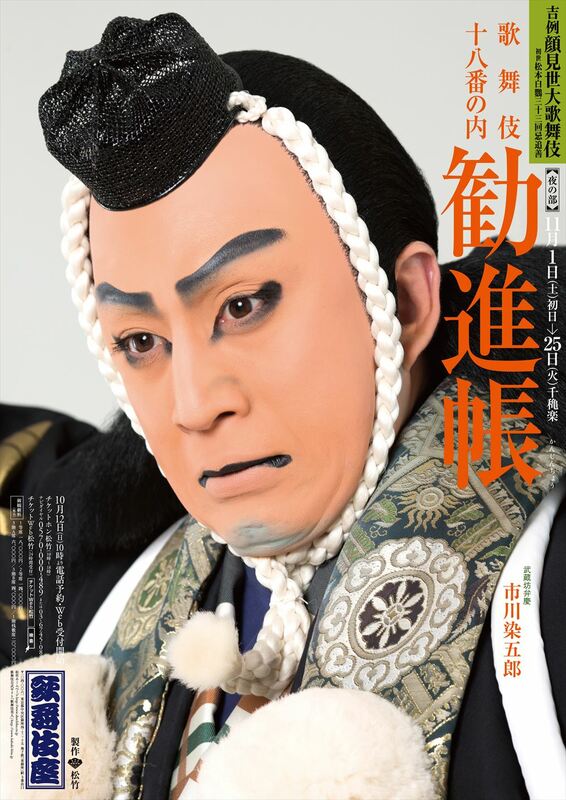 Ichikawa Ennosuke will be the star of the 16th Ôtemachiza stage performances at the Nikkei Hall in Tôkyô [more details]. Ichikawa Somegorô, Ichikawa Ennosuke and Nakamura Takanosuke will take part in special Buyô performances the 27th and 28th of November 2014 in Tôkyô at the Meijiza. Others performers will be dance masters like Fujima Kanjûrô VIII, Onoe Kikunojô III, Hanayagi Yoshijirô VI or Ichikawa Botan III. A special program will be staged at the Kabukiza the 26th of October 2014. It is entitled "Engekijinsai", which means literally the Festival of Stage Performers. The program will be made up of a speech (done by Nakamura Baigyoku), the reading of one scene from "Mabuta no Haha" (done by Living National Treasure Bandô Tamasaburô and Ichikawa Chûsha), a show of the Takarazuka Revue (the Star Troupe (Hoshigumi) led by Yuzuki Reon), the dance "Kagetsu" (performed by the Nô master Umewaka Genshô II and the dance master Fujima Kanjûrô VIII) and the Jiutamai dance "Kosunoto" (performed by Living National Treasure Bandô Tamasaburô). Another special program will be staged at the Kabukiza the 27th of October 2014. It is an event which is related to the 2014 Tôkyô International Film Festival. There will be the performance of Ichikawa Somegorô in the dance-drama "Shakkyô", then a stage speech and the projection of Charles Chaplin's 1931 movie "City Lights". Chaplin, whose love for Japan is well-known, was very much attracted to Kabuki and he actually visited the Kabukiza. Chaplin was photographed with Matsumoto Kôshirô VII, who is Ichikawa Somegorô’s great-grandfather [more details]. The 14th Training Recital produced by the Organization for the Preservation of Kabuki will happen the 25th of October at the National Theatre, after the day performance of the tôshi kyôgen production of "Futatsu Chôchô Kuruwa Nikki". One stage speech and one act from this drama ("Hikimado") will be staged as part of this 14th Training Recital [more details]. The coming 150th anniversary of the passing away of Utagawa Kunisada I (1786~1864 ) will be celebrated with an exhibition of some of his prints at the Ukiyoe Ôta Memorial Museum of Art in Tôkyô from the 1st of October to the 24th of November 2014 [more details]. Ichikawa Ebizô will perform in Tôkyô at the Nihonbashi Mitsui Hall from the 11th to the 26th of October 2014 [more details] and in Kyôto at the Minamiza from the 29th of October to the 2nd of November 2014 [more details]. This is part of his "JAPAN THEATER" Project. There will be two items in the program: one reading session of extracts from the "Heike Monogatari" and the staging of the dance-drama "Otokodate Hana no Yoshiwara". During this month of September 2014, the Kabuki world could have celebrated the 100th anniversary of the premiere of the dance-drama "Onatsu Kyôran" (which happened in September 1914 at the Imperial Theater). Unfortunately, no staging at all in any theater in Japan. Utagawa Kunisada I died the 15th day of the 12th lunar month of the 1st year of the Genji era (1864) ... which was the 12th of January 1865 in the western calendar. The 32nd anniversary (33rd memorial service) of the passing away of Matsumoto Hakuô will be commemorated at the Kabukiza in November 2014. His two sons, Matsumoto Kôshirô and Living National Treasure Nakamura Kichiemon, will be the zagashira [more details]. Deluxe casting for the dance-drama "Kanjinchô", with Matsumoto Kôshirô, Living National Treasure Nakamura Kichiemon and Ichikawa Somegorô in the roles of Benkei, Togashi and Yoshitsune! Publication of the first 2015 Kabuki program! It will be the revival in 5 acts (9 scenes) in January 2015 at the National Theatre of the spectacular drama "Nansô Satomi Hakkenden", with the Otowaya guild led by Living National Treasure Onoe Kikugorô and Nakamura Tokizô [more details]. The Tokiwazu musician Tokiwazu Ichihadayû died the 15th of August 2014. Born in 1930, he received the presitigious title of Living National Treasure (Ningen Kokuhô in Japanese) in 1995. His real name was Aketa Akira. The 26th anniversary (27th memorial service) and the 2nd anniversary (3rd memorial service) of late Nakamura Kanzaburô XVII and late Nakamura Kanzaburô XVIII will be commemorated at the Shinbashi Enbujô in November 2014 in a special Shinpa program. Nakamura Kankurô and Nakamura Shichinosuke will be part of the cast, which will also include the Shinpa stars Namino Kuriko and Mizutani Yaeko. Two classics will be performed: "Tsuruhachi Tsurujirô" and "Kyômai". Koten he no Izanai, literally "Invitation to the Classics", a special program led by Ichikawa Ebizô, will travel abroad for the very first time. Under the title "Japan Theater", a troupe of Nô and Kabuki actors will perform the Nô drama "Shakkyô" and the Kabuki dance-drama "Renjishi". As it is written on top of the bill: "experience the stylised movements and showmanship of Kabuki and the refined drama of Nô on stage together!". This "Invitation to the Classics" abroad will happen in Singapore at the Marina Bay Sands Theater from the 14th to the 16th of November 2014 [more details]. Nakamura Kazutarô will become the 7th iemoto of the Azuma-ryû School of Buyô. He will take the Buyô name of Azuma Tokuyô in September 2014 at the National Theatre, performing the 20th and the 21st of September in a special Buyô program, which will commemorate the 16th anniversary (17th memorial service) of the passing away of Azuma Tokuho I (1909~1998). Azuma Tokuya, the granddaughter of Azuma Tokuho I (also the wife of Nakamura Kanjaku and the mother of Nakamura Kazutarô), will become the 3rd sôke of Azuma-ryû and will take the name of Azuma Tokuho II. The 1st, 2nd, 3rd, 4th, 5th and 6th iemoto were Azuma Tôzô I, Azuma Tôzô II, Azuma Tôzô III, Azuma Tokuho I, Nakamura Tomijûrô V (he was the son of Azuma Tokuho I) and Azuma Tokuya. The 1st and 2nd sôke were Ichimura Uzaemon XV and Azuma Tokuho I (she was the daughter of Ichimura Uzaemon XV). Ichikawa Tsukinosuke will perform with a Shinpa troupe in January 2015 at the Mitsukoshi Gekijô in a special program which will commemorate the 50th anniversary of the passing away of the Shinpa actor Hanayagi Shotarô (1894~1965). Onoe Matsuya, who is extremely active outside Kabuki, will perfom in September 2014 at the Shinbashi Enbujô in the non-Kabuki drama "Happyakumangoku ni Idomu Otoko", which will star the Enka stage giant Funaki Kazuo. Usually, popular Enka singers divide their performances into two parts: a stage drama, the a song recitals. Onoe Matsuya will perform only in the stage drama. "Igagoe Dôchû Sugoroku" will be staged as a tôshi kyôgen (5 acts, 6 scenes) in December 2014 at the National Theatre with Living National Treasure Nakamura Kichiemon as zagashira [more details]. The contents will be different from the November 2013 revival: it will include the rarely-staged "Fujikawa Shinseki" and "Okazaki Yamada Kôbê Sumika" acts. "Okazaki" was staged for the last time more than 44 years ago, in September 1970 at the National Theatre. Karaki Masaemon, which used to be the most famous role of "Igagoe Dôchû Sugoroku" in the past, will be back on stage in his main act ("Okazaki")! The Omodakaya guild will strike Tôkyô in full force and full regalia in October 2014 at the Shinbashi Enbujô [more details] and in November 2014 at the Meijiza [more details]. Led by Ichikawa Ennosuke, they will perform large scale spectacular dramas full of keren which belong to the Ennosuke Shijûhassen (the Best 48 of Ennosuke) collection of plays [more details] or classics for the Omodakaya guild or the Ichikawa clan. These performances are called Ichikawa Ennosuke Funtô Renzoku Kôen, literally Ichikawa Ennosuke's Continuous Struggle Performances. The 26th anniversary (27th memorial service) and the 2nd anniversary (3rd memorial service) of late Nakamura Kanzaburô XVII and late Nakamura Kanzaburô XVIII will be commemorated at the Kabukiza in October 2014. These gorgeous programs will feature Living National Treasure Sakata Tôjûrô, Living National Treasure Bandô Tamasaburô, Kataoka Nizaemon and the two heir of the Nakamuraya guild, Nakamura Kankurô and Nakamura Shichinosuke [more details]. It is worth noting that Nakamura Kankurô and Nakamura Shichinosuke will play for the first times the leading roles of Mishima Yukio's drama "Iwashi Uri". It used to be a classic for the couples Nakamura Kanzaburô XVII/Nakamura Utaemon VI and Nakamura Kanzaburô XVIII/Bandô Tamasaburô. The goruden kombi Kataoka Nizaemon/Bandô Tamasaburô will perform in "Ise Ondo" and "Terakoya". The 7th edition in Tôkyô of a special program called "Shûzan Matsuri" (the festival of Shûzan) will be staged at the Kabukiza in September 2014. It will commemorate the great actor Nakamura Kichiemon I, whose's haimyô was Shûzan. The star of this program will be his adopted son, the Living National Treasure Nakamura Kichiemon II [more details]. A special dance program (Buyô) will be staged at the National Theatre the 21st of August 2014 to commemorate the 2nd anniversary (3rd memorial service) of the passing away of Living National Treasure Nakamura Jakuemon IV. There will be two programs (one afternoon show and one evening show) which will be almost identical [more details]. As part as the Shinema Kabuki ("Cinema Kabuki") series, the two dance-dramas "Ninin Fuji Musume" and "Orochi Taiji", which were shot live in high definition in March 2014 at the Kabukiza, will be released all over Japan in January 2015 (this will be the 21st "Cinema Kabuki") [more details on the dance-dramas]. The number of visitors since the beginning in 1967 for the June and July educational Kabuki programs at the National Theatre, called Kabuki Kanshô Kyôshitu ("Kabuki appreciation class"), went over the symbolic 5,500,000 threshold the 7th of July 2014. There was a ceremony on stage, led by the actors Nakamura Baigyoku and Nakamura Kaishun, to celebrate this event. 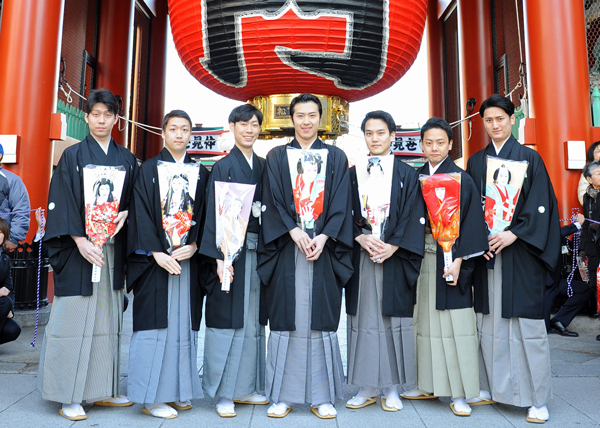 The award for visitor number 5,500,000 was symbolically given to a Fujisawa high school group of students. 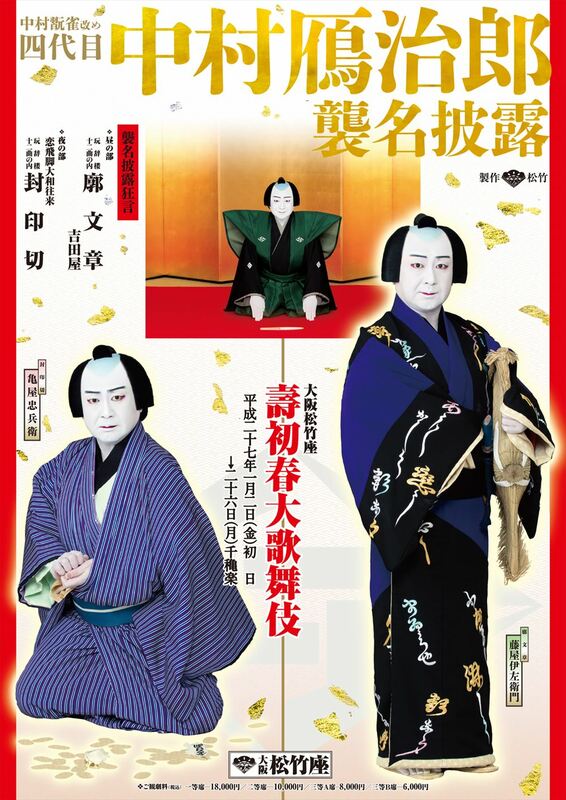 The National Theatre has started a campagne to promote the tôshi kyôgen staging of "Futatsu Chôchô Kuruwa Nikki" in both Bunraku (September 2014) and Kabuki (October 2014). The puppet version will be staged from the 6th to the 22nd of September 2014 at the Small Hall of the National Theatre. It will be made up of "Sumôba", "Komeya", "Nanba Ura Koroshi", "Hashimoto" and "Hikimado". The Kabuki version will not have "Hashimoto" but "Shinkiyomizu" will be part of the revival [more details]. Kawarasaki Gonjûrô and Onoe Ukon will perform in August 2014 at the Minamiza with the Kigeki troupe led by Fujiyama Naomi. Onoe Matsuya performed in Tôkyô at the Mt. Rainier Hall Shibuya from the 11th to the 13th of July 2014 in a newly-created dance-drama which was entitled "Hanagatami". It was based on the eponymous Nô drama. The Nagauta music master Tanaka Denjirô VII and the dance master Fujima Kanjûrô VIII took part in this project. The dance-drama was directed by Suzuki Katsuhide, who was also the writer of the script. The 2nd edition of the Tenshôkai, a gala for the young actor Ichikawa Enshi, a disciple of Ichikawa Ennosuke, will happen in Tôkyo at the Cerulean Tower Nô Theater the 17th of August 2014 [more details]. Special Buyô performances will be staged at the Nihonbashi Gekijô (Nihonbashi Kôkaidô) from the 23rd to the 25th of August 2014. There will be two matinée performances (the 24th and the 25th) and three evening performances (from the 23rd to the 25th). There will be a mix of newly-created dance-dramas based on existing Kabuki dramas or regular dance-dramas like "Momijigari" or "Noriaibune". These performances are entitled Shukô no Hana Final Performances and will be led by dance-masters Fujima Kanjûrô VIII, Onoe Kikunojô III and the young Kabuki star and outstanding dancer Ichikawa Somegorô. Many Kabuki actors will perform: Nakamura Kanjaku, Nakamura Shibajaku, Ôtani Tomoemon, Nakamura Tôzô, Nakamura Kaishun, Ichikawa Komazô, Kataoka Takatarô, Bandô Kamesaburô, Bandô Kametoshi, Nakamura Baishi, Nakamura Kashô, Nakamura Mantarô, Nakamura Hayato, Nakamura Tanenosuke, Nakamura Kazutarô, Bandô Shingo, Ôtani Hirotarô, Ôtani Hiromatsu, Ichikawa Otora, Nakamura Tamatarô, Matsumoto Kintarô and Nakamura Umemaru. Waterways occupy as much as ten percent of Ôsaka's city area, and have played a crucial role in its development as a strategic point in land and water transportation. One of the most picturesque among the city's numerous rivers and canals is the Dôtonbori, which flows today through Ôsaka's vibrant entertainment district. From the Edo period in the 17th century, rows of theaters formed along the river, and the area became the center for both Kabuki and Bunraku. It is a custom to do funa norikomi before July Grand Kabuki at the Shôchikuza [more details]: the stars in the July casting arrived at the theater the 29th of June 2014 in a colorful boat parade, applauded by fans and spectators on the bridges or the banks. Living National Treasure Sakata Tôjûrô, Kataoka Nizaemon, Nakamura Kanjaku, Onoe Kikunosuke, Nakamura Tokizô, Nakamura Senjaku, Nakamura Hashinosuke, Kataoka Takatarô and Kataoka Hidetarô boarded the boats in Hachikenya pier in Tenmabashi and went up to Ebisu Bridge on the Dôtonbori. It ended with the traditional hand-clapping ceremony (koshiki tejimeshiki in Japanese) in front of the Shôchikuza. Living National Treasure Sakata Tôjûrô will perform at the National Theatre the 22nd of August 2014 in the 8th edition of an NHK-sponsored program, which is called Gei no Shinzui (the Essence of Art in English) and is this time dedicated to him and his art [more details]. "Meiboku Sendai Hagi" will be staged as a tôshi kyôgen (4 acts, 6 scenes with the classic structure, no rarely-staged scene will be revived) in November 2014 at the National Theatre with Living National Treasure Sakata Tôjûrô, his two sons Nakamura Kanjaku and Nakamura Senjaku, Nakamura Hashinosuke, Nakamura Baigyoku and Kataoka Takatarô [more details]. The programs for the first kaomise of the year, in October 2014 in Nagoya, have been published. The stars of this kaomise will be the Otowaya guild led by Living National Treasure Onoe Kikugorô and Nakamura Tokizô [more details]. Ichikawa Ukon fell sick and had to stop performing from the 23rd of June 2014, while on tour in the central provinces with the Omodakaya guild. He was replaced by Ichikawa Emisaburô to perform the role of Hideyoshi in the dance "Taikô Sanbasô" ... and Ichikawa Emisaburô was replaced by Ichikawa Emino to play the role of Yodo-no-Kata. Some changes at the Japan Actors' Association (Nihon Haiyû Kyôkai in Japanese): Nakamura Kanjaku and Nakamura Matagorô were promoted as directors. Ichikawa Danshirô stopped being director but is still a member of the association. The top management is still the same: Living National Treasure Sakata Tôjûrô is the chairman, Living National Treasure Onoe Kikugorô the president, Living National Treasure Nakamura Kichiemon the executive director, Nakamura Baigyoku the finance director and Kataoka Nizaemon, Matsumoto Kôshirô and Living National Treasure Bandô Tamasaburô are the 3 permanent directors. Others directors, along with the promoted Nakamura Kanjaku and Nakamura Matagorô, are Bandô Mitsugorô, Ichikawa Sadanji, Nakamura Shibajaku, Nakamura Tokizô, Nakamura Kaishun and Mizutani Yaeko. The 1st edition of a gala program called Yago no Kai for Bandô Yajûrô and his son Bandô Shingo (Ya comes from Yajûrô and Go from Shingo) will happen the 8th and the 9th of September 2014 in Tôkyô at the Nihonbashi Kôkaidô [more details]. Kataoka Ainosuke will perform in August 2014 at the Shibuya Bunkamura Theatre Cocoon in Tôkyô in the drama "Homura Tatsu" ("Rising Blaze" in English), which is the theater adaptation of a 1993-1994 NHK TV drama. The troupe will go on tour in September 2014, performing at the Kariya Cultural Center (3rd~4th Sep), at the Hiroshima Ueno Gakuen Hall (6th~7th Sep), at the Hyôgo Performing Arts Center (10th~15th Sep) and at the Iwate Prefectural Hall (20th~21st Sep). Bandô Yajûrô will perform with the Shôchiku Shinkigeki troupe in July 2014 at the Shinbashi Enbujô. He will perform in a special program which will celebrate the 65th anniversary of the foundation of the Shôchiku Shinkigeki troupe. From the 12th to the 18th of July 2014 "Sumidagawa"
From the 19th to the 25th of July 2014 "Jusshukô"
From the 26th of July to the 1st of August 2014 "Kamiyui Shinza"
From the 2nd to the 8th of August 2014 "Ninin Wankyû" / "Toshima"
The Omodakaya guild will perform for the first time at the new Kabukiza in July 2014 [more details]. They will perform along with Living National Treasure Bandô Tamasaburô and Ichikawa Ebizô ... but without the head of the Omodakaya guild Ichikawa Ennosuke. Kataoka Nizaemon, who was back on stage in June 2014 after several months of absence, will be the star the Grand Kabuki performances in July 2014 at the Shôchikuza. He will perform the roles of Matsuômaru and Ukyô in the drama "Terakoya" and the dance-drama "Migawari Zazen" [more details]. Ichikawa Ebizô will stage in September 2014 at the Minamiza the world of the warrior Taira no Kagekiyo in "Kotohoide Mimasu Kagekiyo". This newly-created aragoto drama was staged for the first time in January 2014 at the Shinbashi Enbujô and it mixes 4 dramas belonging to the Ichikawa clan (Kabuki Jûhachiban): "Kan U", "Kamahige", "Kagekiyo" and "Gedatsu" [more details]. Ichikawa Ennosuke IV and Ichikawa Chûsha IX will celebrate their shûmei in the western provinces in September 2014 [more details]. 4th edition in July 2014 in the city of Matsumoto of a Kabuki program called Shinshû Matsumoto Grand Kabuki (Shinshû is an old name for the province of Nagano, whose main city is Matsumoto), which happens every two years since July 2008. It will be the same program as the 14th edition of the Cocoon Kabuki in Tôkyô [more details]. 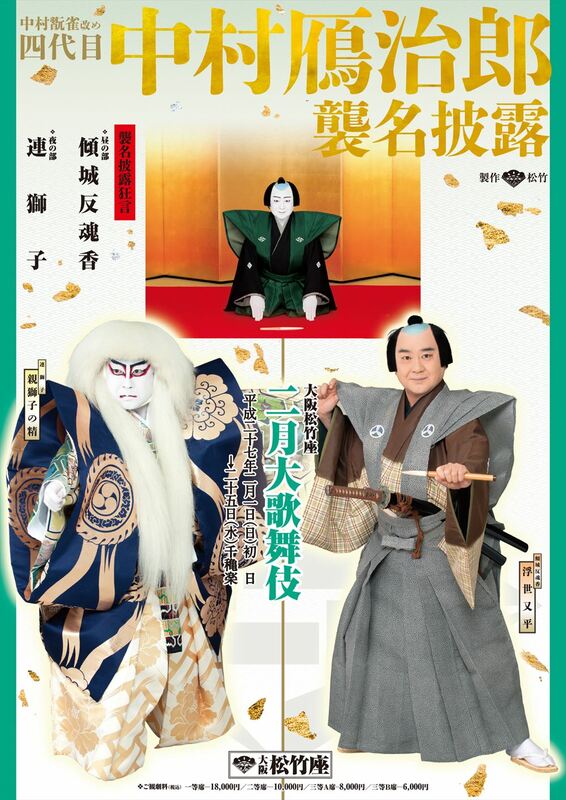 Ichikawa Ennosuke and Ichikawa Emiya, who will not perform at the Kabukiza with the Omodakaya troupe, will do in July 2014 a 6-city Buyô tour [more details]. There was an important funa norikomi on the Hakata River in Fukuoka the 29th of May, before June Grand Kabuki at the Hakataza [more details]. Living National Treasure Sakata Tôjûrô, Nakamura Baigyoku, Nakamura Kanjaku, Nakamura Kaishun, Nakamura Tôzô, Kataoka Ainosuke, Ichikawa Somegorô and others started with a ceremony at Canal City Hakata, boarded their colorful boats at Seiryû Park, did a kôjô at Kawabata Zenzai square, disembarked at Hakata Riverain, visited the Kagami Tenmangû Shrine and ended with a ceremony at Festa square. They were applauded by fans and spectators on the bridges or the banks of the Hakata river [more details]. To commemorate the second anniversary of the opening the 22nd of May 2012 of Tôkyô Sky Tree, Nakamura Shichinosuke and Onoe Matsuya performed the 24th of May 2014 the dance-drama piece "Dango Uri" on an outdoor stage in the Sky Arena at the tower’s base [more details]. 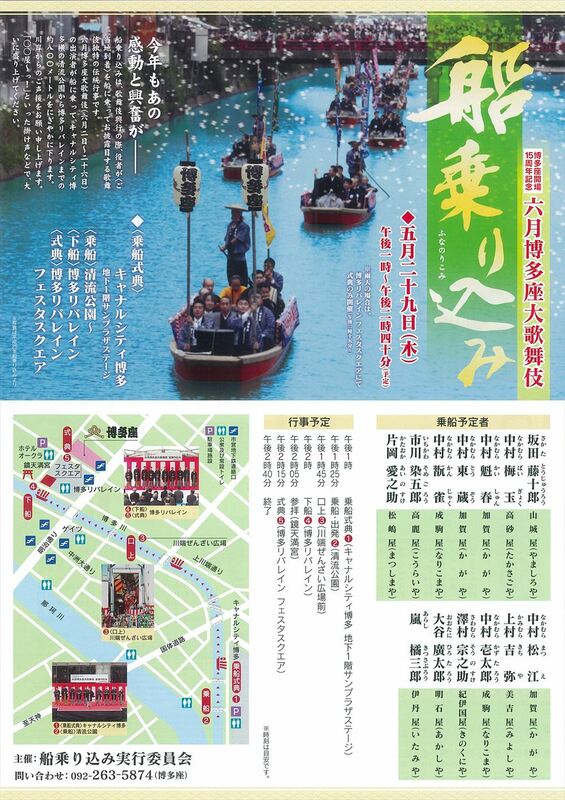 The 5th of June 2014, the 8th edition of the Ningen Kokuhô no Kai, a special gala with many Living National Treasures (all of them being masters of schools of traditional music) will be staged in Tôkyô at the Mitsukoshi Gekijô. One actor will take part in this event: Ichikawa Shun'en [more details in Japanese]. The 2nd edition of ABKAI - Ebikai, the gala of the young star Ichikawa Ebizô, will happen in Tôkyô at the Shinbashi Enbujô from the 5th to the 10th of August 2014. The first item in this program will be a newly-created dance entitled "SOU". The second item will be the "Kawatsura Hôgen Yakata" act of the classic "Yoshitsune Senbon Zakura". Ichikawa Ebizô will perform a chûnori at the end of this play [more details]. A gala program called Idomu (Challenge) for the young actor Onoe Matsuya will happen in Tôkyô at the Nihonbashi Kôkaidô from the 13th to the 15th of August 2014. There will be a kôjô and the staging of both the drama "Hikimado" and the dance "Omatsuri". The usual summer program "August Cool-Breeze Kabuki" will be staged in August 2014 at the Kabukiza. 3 highlights: the revival of Tanizaki Jun'ichirô's drama "Kyôfu Jidai", which was staged for the last time in June 1976 at the Shinbashi Enbujô; The revival of "Terutora Haizen" with Nakamura Hashinosuke in the role of Nagao Terutora; the production of "Kaidan Chibusa no Enoki", with the same casting as the July 2014 production in New York City, which is subtitled Hôbei Kabuki Gaisen Kinen, the Commemoration of the Triumphal Return of the Kabuki (troupe) which Visited to America [more details]. Kataoka Ainosuke was given the 15th of May the Cotton USA Awards 2014. It is given by the Washington DC-based Cotton Council International to Japanese celebrities who represent "style, beauty and natural comfort", in order to promote the cotton industry in Japan. Important: Nakamura Kanjaku V will take the name of Nakamura Ganjirô IV in January 2015 and February 2015 in Ôsaka at the Shôchikuza. This is one of the most prestigious names for Kamigata Kabuki, and there is no name-holder since December 2005. This shûmei will also be celebrated in Tôkyô at the Kabukiza in April 2015, in Fukuoka at the Hakataza in June 2015 and in Kyôto at the Minamiza in December 2015. A special TV program about Kabuki available online for free! It is named Kabuki Kool and is produced by NHK World TV. The hosts are Ichikawa Somegorô and Haruka Christine. The next episode, "the beauty of onnagata", is scheduled the 21st of May 2014 (15:30 and 21:30 UTC) and the 22nd of May 2014 (3:30 and 9:30 UTC). You can watch NHK World TV Live Streaming on any kind of device [more details]. Kataoka Nizaemon will be back on stage in June 2014 at the Kabukiza! He will perform in the dance "Omatsuri" [more details]. The son of Onoe Shôroku will receive the name of Onoe Sakon III and make his debut on stage (hatsubutai) in June 2014 at the Kabukiza. He will play the role of Ranpei's son Shigezô in the spectacular drama "Ranpei Monogurui" and the role of Shigezô's father Ranpei will be played by ... his real father [more details]. Living National Treasure Bandô Tamasaburô will perform in Kyôto in June 2014 at the Minamiza. Not in Kabuki but in Kumi Odori from the 5th to the 12th of June and in Jiutamai from the 15th to the 21st of June [more details]. "Futatsu Chôchô Kuruwa Nikki" will be staged in a tôshi kyôgen production (4 acts; 5 scenes) in October 2014 at the National Theatre. The rarely-staged "Shinkiyomizu" will be the opening act. Others scenes are the same ones as the January 2003 production in the same theater: "Sumôba", "Komeya", "Nanba Ura Koroshi" and "Hikimado". Unfortunately "Izutsuya" or "Hashimoto" are not part of this program. The stars will be Matsumoto Kôshirô and his son Ichikawa Somegorô [more details]. The Japan Times published the 30th of April an interesting interview of Ichikawa Somegorô about his coming performances in May 2014 at the Meijiza [interview]. Two actors of the Mikawaya and Takashimaya guilds, Ichikawa Shigenosuke and Ichikawa Sajirô, will celebrate their success at the nadai exam in May 2014 at the Kabukiza. Ichikawa Shigenosuke and Ichikawa Sajirô, who passed the nadai exam in September 2012, will respectively take the names of Ichikawa Aragorô V and Ichikawa Tsutanosuke III. Living National Treasure Bandô Tamasaburô has received the Purple Ribbon Medal (Shiju Hôshô in Japanese), one of the six Japanese medals of honor awarded by the Japanese Government to deserving citizens. The first anniversary of the opening of the new Kabukiza was celebrated on the stage of this prestigious theater the 28th of April 2014. 170 actors took part in this important event. The event started with 12 actors breaking open barrels of amazake (sake-like sweet fermented rice drink) at Kobikichô Square at the basement of the theater to express appreciation to Kabuki enthusiasts. They offered square wooden cups (masu) to people around. It was followed with a special dancing program by young actors and a video about the kokera otoshi performances [more details]. Six albums containing never-seen-before photos of the Shôwa star Nakamura Utaemon VI were discovered at the end of 2013 by his adopted son Nakamura Baigyoku. They were donated to Waseda University’s Tsubouchi Memorial Theatre Museum and some of them were on display at the museum as a part of its exhibition dedicated to Nakamura Utaemon VI, which was held from the 25th of March to the 25th of April 2014 [more details]. Bandô Shinsha is no more a Kabuki actor. He appeared on a Kabuki stage for the last time in January 2014 in Ôsaka at the Shôchikuza. There is a rumour about a severing of relationship between Bandô Shinsha and his master Bandô Takesaburô. Of course, there was no communication done by the Shôchiku Company. The Kabuki world does not wash its dirty linen in public. This young actor performs nowadays outside Kabuki, using the stage name Akimoto Michiyuki. We do wish him a successful career. A new website for Ichikawa Ebizô! ichikawaebizo.com opened in March 2014. It has an online shop and all the social networks tools are gathered. You can even install an Iphone App about the heir of the Naritaya guild. Heavy marketing and communication campaigning for an actor who does his best to be a youth icon in nowadays Japan. Ichikawa Tsukinosuke and Ichikawa Shun'en will perform in Shinpa in August 2014 (from the 7th to the 28th) at the Mitsukoshi Gekijô. Ichikawa Tsukinosuke will perform in "Hotaru" and "Korikori Banashi". Ichikawa Shun'en will perform only in the latter drama. A special program at the Minamiza in Kyôto to explain stage mechanisms, from the tachimawari to the hanamichi: in this program, you can experience some of the unique stagecraft tricks used in Japanese Kabuki theatre. Tours are organized eight times a day from the 24th to the 29th of April 2014 and last about 30 minutes. The number of people for each tour is limited. Tour will be conducted in Japanese [more details]. A special exhibition dedicated to the Shôwa onnagata star Nakamura Utaemon VI started the 25th of March 2014 at the Tsubouchi Memorial Theatre Museum, located within the Waseda University. It will end the 25th of April 2014. If you are in Tôkyô this spring, do not hesitate to visit this beautiful museum! Two new joiners in the first league of Kabuki actors ("kanbu shôshin"): Bandô Kitsutarô, a disciple of late Ichimura Uzaemon XVII, will take the name of Ichimura Kitsutarô in May 2014 at the Kabukiza. Late Nakamura Utaemon VI's faithful disciple Nakamura Kamenojô III will celebrate his promotion in April 2014 at the Kabukiza. Ichikawa Ennosuke IV and Ichikawa Chûsha IX will celebrate their shûmei in the central provinces in June 2014 [more details]. Nakamura Matagorô III and his son Nakamura Kashô IV will celebrate their shûmei in the western provinces in July 2014 [more details]. Nakamura Umemaru and Nakamura Kyôzô will play in a modern version of Izumi Kyôka's "Tenshu Monogatari", which will be staged in Ôsaka at the Festival Hall the 23rd of April 2014 and in Tôkyô at the Orchard Hall the 26th and 27th of April 2014. Nakamura Shidô will perform in Tsuji Hitonari's modern drama "Kaikyô no Hikari" (based on his eponymous novel which was published in 1997) from the 11th to the 29th of April 2014 at the Ôtemachi Hall. The original music was created (and will be performed) by Luna Sea's extremely talented guitarist Sugizo. Nakamura Kikaku will perform in Nishida Daisuke's modern drama "Mahoroba Kanata" from the 3rd to the 13th of April 2014 in Tôkyô at the Galaxy Theatre [more details in Japanese]. A special exhibition about Kabuki tours outside Japan, which is entitled "Kabuki ha Tabi Suru Taishikan" (in English: "Kabuki, the Travelling Embassy") will be held at the Kabukiza Gallery. Located on the fifth floor of the Kabukiza Tower building, the gallery consists of an exhibition room and a small hall. It will be divided into two parts: the first part from from the 2nd of April 2014 to the 24th of August 2014 and the second part from the 4th of September 2014 to the 25th of January 2015. The Hakataza, the main theater in Fukuoka, will celebrate the 15th anniversary of its opening in June 2014. 2 Kabuki programs will be staged and the troupe will be led by Living National Treasure Sakata Tôjûrô [more details]. The Dankikusai May Grand Kabuki performances will be back at the Kabukiza after 5 years of absence (it was staged for the last time in May 2008). Due to the closing/opening ceremonies at the Kabukiza, the non-availability of this theater or the passing away of late Ichikawa Danjûrô, it was either staged in Ôsaka at the Shôchikuza (in May 2010 and May 2011) or not produced at all. It will be staged in May 2014 at the Kabukiza to celebrate the first anniversary of the passing away of Ichikawa Danjûrô XII [more details]. Ichikawa Somegorô will perform for the very first time the prestigious ten roles of "Date no Jûyaku", in May 2014 at the Meijiza [more details]. These roles were the privilege of the star Ichikawa Ennosuke, who revived them for the first time in April 1979 and performed them in 9 productions from 1979 to 1999. In the 2010s, it was staged 3 times with Ichikawa Ebizô in the 10 roles, in January 2010 and August 2012 at the Shinbashi Enbujô, and in May 2013 at the Minamiza. Bandô Mitsugorô received the 27th of February 2014 the Best Actor Award from the 21st Yomiuri Engeki Taishô (the Yomiuri Theatre Awards), sponsored by the famous paper Yomiuri Shimbun. Onoe Shôroku and Nakamura Kosanza are the award-winners of the "Outstanding Performance Award" and the "Achievement Award" of the 35th Matsuo Artistic Awards (Matsuo Geinô Shô). He will receive his prize the 29th of March 2012 at the ANA Intercontinental Hotel in Tôkyô. Ichikawa En'ô II did a daily chronicle for one month (all days of February 2014) in the culture page of the morning edition of the Nihon Keizai Shimbun, a leading economic newspaper in Japan. This serialized column was entitled "My CV" (watashi no rirekisho in Japanese). "Rokkasen Sugata no Irodori" will be staged to open the 37th Actors Festival. It is a humorous series of five dances, which show the ancient poetic geniuses famous from classical Japanese literature, reinterpreted to the tastes of Edo period audiences. Ono no Komachi, the only woman of the six, was famous as a great beauty and in this dance, all the other poets are in love with her. In "Henjô", Onoe Shôroku and Nakamura Shibajaku play the roles of Sôjô Henjô and Komachi. In "Bun'ya", Nakamura Kankurô plays the role of Bun'ya no Yasuhide. In "Narihira", Onoe Kikunosuke and Nakamura Shichinosuke play the roles of Ariwara no Narihira and Komachi. In "Kisen", Ichikawa Somegorô and Nakamura Tokizô play the roles of the priest Kisen and Okaji. In "Kuronushi", Ichikawa Ebizô and Bandô Tamasaburô play the roles of Ôtomo no Kuronushi and Komachi. The second item of this 37th Actors Festival is the dance "Nankô". A 1902 Nagauta-based dance-drama focusing on the 14th century warrior Kusunoki Masashige. A revision of "Suzu-ga-Mori" (entitled "Suzu-ga-Mori Nishiki no Kumokago") with the two main roles, Shirai Gonpachi and Banzui Chôbê, played by Ichikawa Somegorô's son Matsumoto Kintarô and Onoe Shôroku's son Fujima Taiga. The kumosuke and kagokaki will be played by major actors and ... two actesses: Namino Kuriko and Mizutani Yaeko. Nakamura Hayato, who performed in February 2014 at the Hakataza, did a special public relations campaign for the National Tax Agency the 14th of February 2014 in Fukuoka. Some taxpayers must fill their final tax return for the previous year between the 16th of February and the 15th of March in order to pay their income tax. Why not a little reminder with a Kabuki actor ? [more in Japanese]. A special program starring Ichikawa Ebizô and mixing Kabuki, Nô and Opera will be staged in April 2014 at the Minamiza. The young heir of the Naritaya guild will perform in a special version of "Genji Monogatari", along with the Nô actors Katayama Kurôemon X, Umewaka Kishô II and Kanze Yoshimasa and the Opera Countertenor Anthony Roth Costanzo. Kataoka Takatarô will be a special guest [more details]. The Harimaya veteran Nakamura Kichinojô II passed away the 26th of January 2014 (lung abscess). Bandô Mitsugorô will be back on stage in April 2014 at the Kabukiza, where he will perform in the dance-drama "Kotobuki Utsubo Zaru". The 14th edition of the original Cocoon Kabuki will happen in June 2014 at the Theatre Cocoon. These performances recreate the atmosphere of the Edo koshibai and brings the actors closer to the audience. the drama "Sannin Kichisa" will be staged under the supervision and direction of Kazuyoshi Kushida. The stars of this new edition will be the heirs of late Nakamura Kanzaburô, the founder of Cocoon Kabuki, Nakamura Kankurô and Nakamura Shichinosuke. The third Kichisa will be played by the young and popular actor Onoe Matsuya, who will take part in Cocoon Kabuki for the first time. Nakamura Tokizô will play for the first time in his career the role of Otomi in Kawatake Mokuami's drama "Musume Gonomi Ukina no Yokogushi", in March 2014 at the National Theatre [more details]. This kizewamono drama is commonly called "Kirare Otomi" ("Scarface Otomi") is a kakikae kyôgen based on "Kirare Yosa" ("Scarface Yosa"). Living National Treasure Sakata Tôjûrô will do his isse ichidai performance for the role of the courtesan Ohatsu in the drama "Sonezaki Shinjû", which will be staged in April 2014 at the Kabukiza; the role of Ohatsu's lover Tokubê will be played by his son Nakamura Kanjaku. Ichikawa Sadanji's disciple Ichikawa Satojirô celebrated his success in 2007 at the nadai exam in January 2014 at the Shinbashi Enbujô, where he received the name of Ichikawa Sashô IV. The April 2013, May 2013 and June 2013 Kokera Otoshi (opening ceremony) Performances at the Kabukiza have been released in DVD and Blu-Ray. The DVD package (18 discs; 75,000 JPY) was released in Japan the 18th of December 2013 [more details in Japanese]. The Blu-Ray package (10 discs; 88,000 JPY) was released in Japan the 29th of January 2014 [more details in Japanese]. The famous English commentaries are included! The Zenshinza tateonnagata Kawarasaki Kunitarô will perform the 7 roles of Tsuruya Nanboku IV's masterpiece "Osome no Nanayaku" in May 2014 at the National Theatre [more details]. The two months (four programs) of March 2014 and April 2014 at the Kabukiza, which should have been dedicated to the shûmei of Nakamura Utaemon VII and Nakamura Fukusuke X, will be replaced by special programs called Hôôsai, which means Phoenix Festival. The Phoenix Bird is the symbol of the Kabukiza as it is the official mon of this prestigious theater. In March 2014, there will be 4 Living National Treasures on stage! 3 of them will perform the 3 major roles of the classic "Kanjinchô" [more details]. In April 2014, Living National Treasure Sakata Tôjûrô will do his isse ichidai performance for the role of the courtesan Ohatsu in the drama "Sonezaki Shinjû" and Bandô Mitsugorô will be back on stage [more details]! Ichimura Manjirô, Nakamura Shidô and Bandô Minosuke will perform in February 2014 at the Shinbashi Enbujô in Makino Nozomi's comedy "Haha o Tazunete Hizakurige", along with famous actors or actresses like Okuda Eiji, Fujiyama Naomi or Mizutani Yaeko. This drama will be staged with the same casting in June 2014 at the Shôchikuza. Kataoka Kamezô will play in Kazuyoshi Kushida's 1977 musical masterpiece "Motto Naite-yo Furappa" ("Cry Some More for Me, Flapper" in English), along with Matsu Takako, Matsuo Suzuki, Akiyama Natsuko, Ryô, Daidô Shunsuke, Suzuki Ranran, Ôta Midori Laurens, Ômori Hiroshi, Manako Keiji, Konishi Yasuhisa, Sakô Yoshi, Uchida Shinichirô, Kataoka Shôjirô, Kushida Kazuyoshi and Ishimaru Kanji. This musical drama will be revived in Tôkyô at the Theatre Cocoon from the 8th of February 2014 to the 2nd of March 2014. It will also be staged in March 2014 in Matsumoto at the Matsumoto Performing Arts Centre and in Ôsaka at the Theater Brava. Kataoka Ainosuke will perform in Mitani Kôki's drama "Sake to Namida to Jikiru to Haido" ("Alcohol, Tears, Jekyll and Hide" in English), which will be staged at the Tôkyô Metropolitan Theatre (10~30 April 2014) and at the Galaxy Theatre (4~18 May 2014).